TROPICAL PARADISE describes our immaculate beach house that is decorated to 'beachy' perfection with colorful thematic rooms. It has just been painted throughout; cleaned from top to bottom; and filled with beach-themed decor for your enjoyment. It's fully furnished with three bedrooms, two full baths, and an extra-large great room and kitchen featuring cathedral ceilings. The great room has a huge wrap-around leather sofa including a large TV complete with DVD/VCR. The kitchen has cabinets galore that are filled to the brim with utensils. This fully-equipped kitchen offers a refrigerator with ice maker, dishwasher, and microwave mounted above the stove. There is a standard-sized washer and dryer off the main hallway. Bedrooms: We have a TV in each bedroom complete with DVD/VCR. The master bedroom has a king bed; bedroom 2 has a queen; and, bedroom 3 has twins. It's located at 1881 Ocean Lakes Campground, Myrtle Beach, SC. Amenities: Enjoy our extra-large covered front deck, side deck, and stairway for rain protection and lounging. There's ample uncovered decking for sunbathing as well. The outdoor ceiling fans supply a cool breeze on a hot summer day while you enjoy outdoor dining on the upper deck or below in the Tropical Lounge. Parking space below the house will accommodate four small to mid-size cars. Wow! An enclosed outdoor shower, for rinsing sand off after frolicking on the beach, is located on the ground level. Our golf car will prove to be quite handy for transportation to the beach and scenic cruising at Ocean Lakes. Cleaning Rules: The house cleaning rules are posted on the fridge in the beach house, and the cleaning products are provided for you to clean at your departure. If the home has not been cleaned , your deposit will be withheld to pay for a cleaning service after the fact. 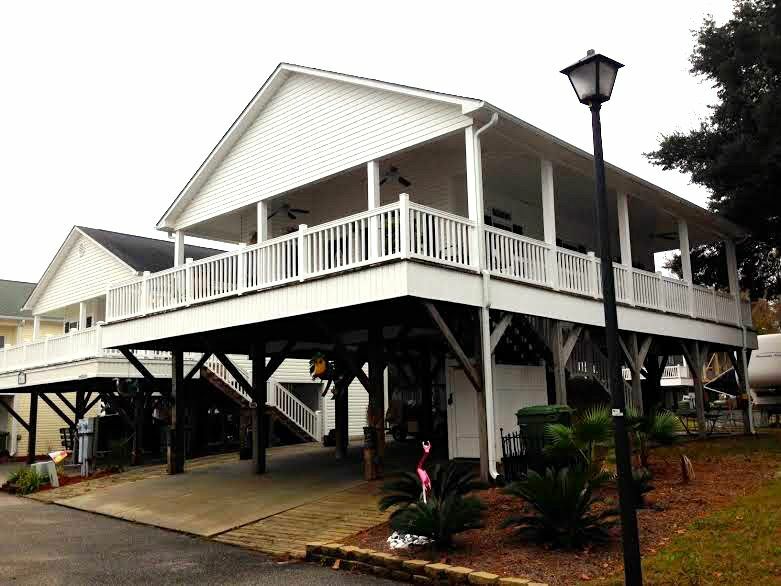 Fabulous Location: It's located at 1881 Ocean Lakes Campground, Myrtle Beach, South Carolina. Newer homes on street; all on stilts. Located close to the South Gate for easy access to and from the campground. This is a plus since traffic will get hectic. No through traffic on our street which makes it much safer for kids and quieter/ more relaxing for adults. Linens/Supplies: You will need to bring your linens (sheets, towels, etc. ), bath soaps, detergents and paper products. Please note that Ocean Lakes is a family-oriented, gated, and constantly patrolled community. All guests must abide by Ocean Lakes rules and regulations. My husband and I are thrilled about our recent beach house purchase (Feb., 2012)! I'm a former school teacher and an author of children's books. When our daughter accepted a job in Myrtle Beach and relocated here with her family, we began searching for a house as well. We could think of no other place to purchase a home than Ocean Lakes. In fact, my husband and I have camped with our children here numerous times over the years. We love the premise that it's gated with a guard on duty at all times; officers are everywhere maintaining safety; and, it's family- oriented. The Ocean Lakes beach area is well-maintained; the pools are huge; and, even the laundry facility is clean. We especially like the golf car atmosphere and the annual golf car day. Covered stairs and decking, for protection from the rain. My friends and I had a great time staying at the Tropical Paradise on Stilts! The house was very clean, decorated beautifully and located on a quiet street. The wraparound deck had several seating areas, but we especially enjoyed sitting out on the uncovered part to enjoy the morning sun. The golf cart was cute and in good working order. The owner was very friendly and fantastic to work with and left instructions for everything. I would definitely stay in this house again! Thank you so much for your exceptional and thorough review! Updating the beach house with stunning decor and enticing amenities for our honored guests is a definite and fun-filled goal for us! Utmost, we want every tenant’s vacation in our Tropical Paradise on Stilts to be the “most memorable ever” by not only supplying splendid lodging but by engaging in delightful and informative conversations with each guest like family! The home was perfect for us. The owner is a delight to speak with. We will stay there again in the future. My family and I have just returned from spending a long weekend at the tropical paradise on stilts! We truly enjoyed our stay and felt like we had the whole street to ourselves this time of year. Ocean Lakes is a great place to bring your family. There is so much to do you don't really need to leave. What made this trip even better was our stay at the tropical paradise :-). Mary was great to work with. The home was extremely clean and well-maintained. You can tell that Mary has put a lot of time into the decorations. I love the tropical paradise theme throughout the house . My grandchildren and I enjoyed spotting new things throughout the house during our visit. We didn't even notice until the end, when we were cleaning up, that the trashcan in one of the bedrooms was a sand pail! Mary has an eye for decorating! My grandchildren and I would also like to thank you for sharing your books with us. They did manage to read a few of them during our stay. If in the future we return to Ocean Lakes I could not think of a better place to stay! From the house itself to the great location--- I would give it a 10! Thank you Mary! Thanks so much for the glowing and heartfelt review! And, I would be thrilled to have your precious family stay again at our Tropical Paradise Beach House! Thanks, too, for the house decor compliment! I do love to decorate with unusual beachy finds, so as to make the house not only comfortable but striking. My ultimate goal... to provide the emenities of home, coupled with memory-making decor, for the ultimate vacation retreat! I initially rented Mike & Mary's place in October for our wedding anniversary. Then the hurricane came. So, Mary & I agreed that I could come at the end of January/beginning of February to celebrate my husband's birthday. Mary even called Ocean Lakes and got the office to exchange my parking passes, so I would not have to pay the daily resort fee twice. The house was exactly as advertised. I couldn't have been happier on arrival. We were even lucky enough to enjoy 70 degree weather during our stay. From start to finish (I received my returned deposit back before the promised 10 days were up after the house was inspected at my departure), Mary was a joy to work with. No worries...You will love this house. Thanks so much for penning such an impeccable review! I, too, was deeply saddened that the hurricane spoiled your anniversary trip, but quite elated that we could work out another vacation time that you could celebrate another blessed event! Correct advertising is paramount! I diligently try to keep the pics updated on VRBO, so that potential tenants can not only view our beach house with its current decor, but see if it is also well-maintained! We had a fabulous time staying in Mike and Mary's home. The location, while not on the beach, was great for us because it is close to the entrance and on a quiet, dead end street so we didnt have any traffic which was wonderful since we ate every meal out on the deck! We really loved the fact that the golf cart is included - it's a must for getting back and forth to the beach and just cruising around in general. The house itself was very nice and sparkling clean upon arrival. The couch is super comfy, as are the mattresses. Overall, we had a great time and hope to return!! Your review depicts the home's location perfectly! Tenants, as well as Mike and I, love the tranquil location of our beach house. When you are on vacation, you dread the thought of being bombarded with loud noises or waiting in an endless line of traffic to exist the park for eating, shopping, sight-seeing, and excursions. This serine area for of our "Tropical Paradise" beach house lends itself to easy accessibility to entrances/exits which is an amenity that is priceless!! Further, the setting is perfect for watching television outside in the tiki lounge, barbecuing on the grill, and even snoozing in the hammock. This house was perfect. It was nice and very clean, it was in a peaceful location which was perfect for my family and I. Mary was great at communicating and so very sweet. This house made us feel like we was at home away from home. "Your home away from home" is our top priority for your vacation; and, we are so thankful that you felt that while staying in our beach house! It is my pleasure to speak with tenants and answer any questions or concerns that they may have. I truly enjoy it! In fact, I am always spinning ideas around in my head about how to make improvements, and tenants' feedback is vital to accomplishing that reality. Hopefully, as a result, your family's vacation in our home will be "etched in your memory" as the best one ever! If the beach house house has been left clean, and with no damage to property, the tenant/tenants security deposit will be returned within 10 days.